I am a repeat customer of MiniMovers and have always found the MiniMovers team very professional and would recommend MiniMovers to anyone looking for a moving team. I was happy with your service. It was easy to book and Jake and Michael were on time, polite, and looked after my things. I have used MiniMovers twice and will continue to use if needed again. They are efficient, careful and very polite. The 3 young men that helped me moved were great. Very helpful and fun also. Will be moving again later this year and would love to have the same 3 movers. Brilliant!!! The boys were very helpful and did a excellent job with our recent move. Highly recommend MiniMovers. The guys went above and beyond! Thanks. 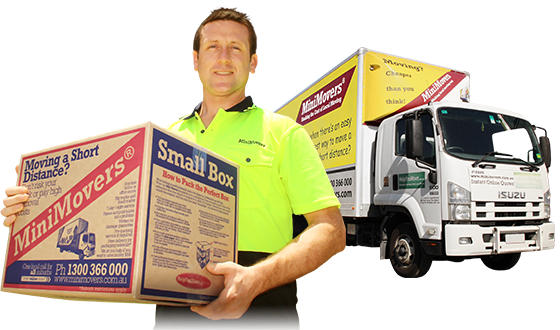 MiniMovers has revolutionised “local, short distance, direct door to door moving”. We were the first to develop the hourly rate system, where you pay only for what you use, while allowing you the total freedom to help as much as you want. Yes – you can control the costs! Before we came along, the only option, other than breaking your back to do it all yourself, was an expensive, old fashioned , fixed price company. Experience a unique removals system that gives you the best value whether you’re moving just up the road or even across town. We are the perfect balance between hiring a truck and using a traditional moving company. We operate in many locations all throughout Australia. These areas include Brisbane, Gold Coast and Melbourne, indeed, all of South East Queensland and the Greater Melbourne area! Check your postcode to see if we are located near your pick-up suburb. We simply send a proper moving truck your way with two great removalists and guarantee their workmanship. We deliver a hassle-free move with professional movers using a cost-efficient system where you can control the price. If you’re moving house or office and like to work off a checklist — MiniMovers have put together this Free Ultimate Moving Checklist just for you. We’re pleased that you chose MiniMovers for your move! And we're excited to add you to our growing list of satisfied customers. Please fill out the form below and share some feedback about your unique moving experience.